The Commission for Risk Mitigation of the Central University of Venezuela (COMIR-UVC) has been promoting a number of internal and external initiatives in order to incorporate the reduction of disaster vulnerability as a value added to its academic program and internal operations. In keeping with its role of contributing to the quality of life and greater development of the country, the University Council created the UCV Journalism Award for Socio-Natural Disaster Risk Mitigation. The main purpose of this award is to recognize, on an annual basis, the contribution of social communicators in incorporating disaster prevention into Venezuela’s national culture. 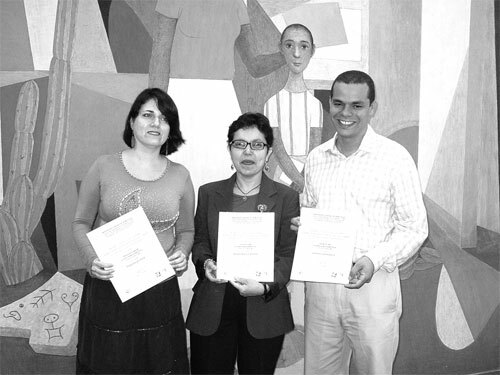 Due to the quality of their writing, originality in their research, depth of information, educational content, and ethical values in highlighting the social importance of risk mitigation, the following journalists were recognized: David Gonzales and Moraima Guanipa received the award for print news; Teresa Quilez received a special mention; and Celina Pedroza and the team from the UCV’s Information and Communications Department received special recognition in the radio and television categories.